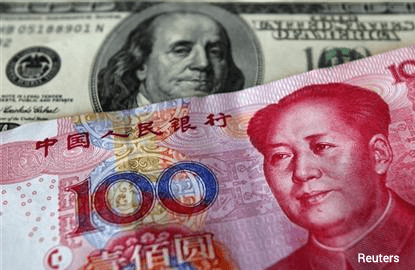 (Feb 1): Donald Trump probably hasn’t followed through on campaign pledges to label China a currency manipulator because the yuan’s been stronger than he anticipated, the US President’s pick as ambassador to China said Tuesday. The yuan gained 0.9% against the dollar in January, its steepest advance since March, after sinking 13% in the three years through 2016. While Trump has criticized Asian policy makers for keeping their currencies weak to aid exports, Chinese authorities have been burning through foreign reserves to support the yuan amid an economic slowdown and capital outflows. Tensions between the world’s two largest economies have heightened in recent months. On the campaign trail last year, Trump blasted trade deals with China that generated US deficits. After winning the presidential election, Trump abandoned almost four decades of diplomatic protocol on Dec 2 by speaking directly with the leader of Taiwan, which Beijing considers a province. In early January, China moved to slap tariffs on an ethanol byproduct that’s fed to animals, worth about US$2 billion to America’s agricultural sector. Branstad has a long-standing relationship with Chinese President Xi Jinping. They met in 1985 on Xi’s first trip to Iowa, when he was a young agricultural official from Hebei province, working as director of the Feed Association of Shijiazhuang Prefecture. Iowa is America’s biggest corn, soybean and biofuel producer. The Iowa governor said he sees himself as a “go-between” between Trump and Xi, and that he’s optimistic the two countries can find common ground on trade, including agricultural commodities. Last week, Trump signed an executive order to withdraw the US as a signatory to the Trans-Pacific Partnership accord with 11 other nations. Those types of pacts are likely to be replaced with bilateral trade agreements between America and other countries, according to Branstad. He declined to share further details, saying he’s been advised to not get into the minutiae of foreign policy until after he’s confirmed by the US Senate.